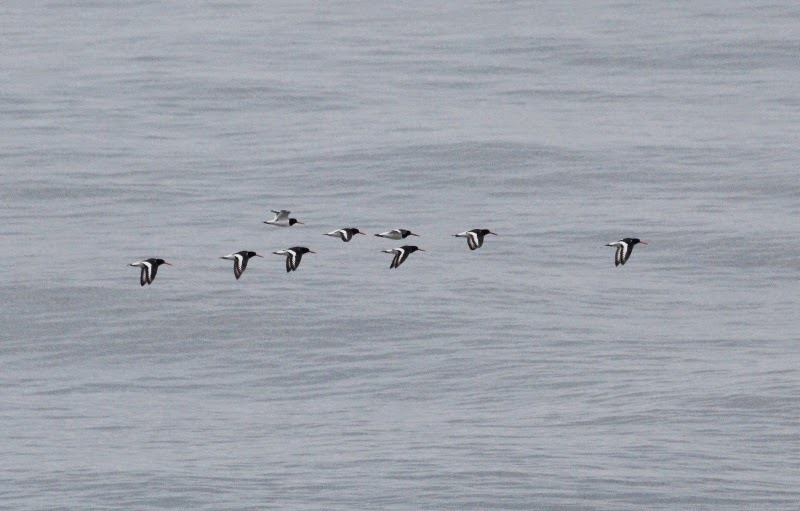 A much quieter day over the sea with very few waders moving. Past Long Nab (south unless stated) were 18 Fulmar + 56 north, 68 Manx Shearwater + 11 north, 512 Gannet + 105 north, 3 Cormorant + 11 north, 4 Teal + 7 north, 5 Tufted Duck + 1 north, 121 Common Scoter + 311 north, 1 Red-breasted Merganser north, 71 Oystercatcher, 1 Dunlin, 1 Bar-tailed Godwit, 5 Whimbrel, 1 Curlew, 1 Arctic Skua + 1 north, 14 Black-headed Gull + 19 north and 8 in and west, 18 Common Gull, 24 Great Black-backed Gull, 71 Sandwich Tern + 13 north, 6 Common Tern, 1 Arctic Tern, 54 Auk sp + 56 north, 1 Puffin north, 38 Swift and 1 Alba. Elsewhere an impressive 34 Common Sandpiper were on Wykeham South Lake where there were also 4 Egyptian Geese, little Egret was at Scalby Mills, 2 Shoveler and a Green Sandpiper were on Flotmanby Carr and a Kingfisher wast at Johnson's Marsh. At Long Nab there were 45 Tree Sparrow and 5 Peregrine (including the 3 Juveniles) which at one point were all chasing and practising on one Whimbrel which did eventually escape, minus a few feathers! !